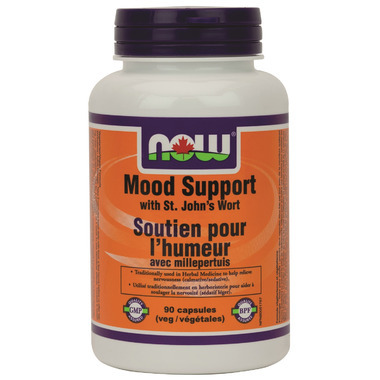 NOW Foods Mood Support with St. John's Wort is a unique, nutritional supplement that combines vitamins, minerals, amino acids and herbal extracts that aid in the support of a healthy nervous system and a positive, balanced mood state. This product uses powerful amino acids as the basis for formula, where most products use Herbs or EFA’s for their mood formulas. Mood Support's comprehensive formula is unparalleled in the market. Directions: Adult Dosage: Take 2 capsules twice daily with food, a few hours before or after taking other medications. Use for a minimum of 1 week to see beneficial effects. Consult a health care practitioner for use beyond 12 weeks. Non-Medicinal Ingredients: Veg Capsule (hypromellose, water), Cellulose, Magnesium Stearate (vegetable source), Silica and Stearic Acid (vegetable source). Caution: Do not use if you are pregnant, breastfeeding, attempting to conceive, or if you have scleraderma. Consult a health care practitioner prior to use if you have a medical condition or are taking prescription medication, other medications or natural health products. Consumption with alcohol, other medications or natural health products with sedative properties is not recommended. Exercise caution if operating heavy machinery, driving a motor vehicle or involved in activities requiring mental alertness within 2 hours of consumption. Avoid prolonged exposure to sunlight, ultraviolet light (UV) or UV therapy. Consult a health care practitioner if symptoms persist or worsen or if sleeplessness persists continuously for more than 3 weeks. Some people may experience diarrhea, nausea, vomiting, restlessness, headaches, gastrointestinal disturbances or abdominal pain. Discontinue use and consult a health care practitioner if you show signs of hypersensitivity or allergy, weakness, oral ulcers, abdominal pain accompanied by severe muscle pain or skin changes. I have been using this for a few weeks now. I do feel some improvement with over all body/hormone/mood regulation. I've been using this for a month. I noticed a difference in my sleep, I used to wake up constantly during sleep but that's improved now. I just wish it was cheaper.